» Why is _delay_ms_ behave unpredictably ? ATtiny85 with _delay_ms_ . Weird behavior. New to AVR programming. I am using this Setup: Visual Studio and Visual Micro with Sparkfun Tiny Programmer. Using VS Arduino1.6/1.8 Gemma configuration. I am experimenting with this short bit of code trying to understand why my _delay_ms_ command is not behaving as expected. When my ATTiny85 boot it will make my LED flash every 12 seconds (6secON 6secOFF), where it should be a 2 seconds period. After lots of reading and playing around I tried the code line CLKPR = (1 << CLKPCE); Delay got back to normal. I get a 2 seconds period. Changing F_CPU value from 1MHz to 8MHz makes absolutely no difference. Why is the delay function not working as expected? I need to understand. F_CPU has ZERO effect on the actual core clock frequency. Nada! What F_CPU does do is tell the software what frequency the clock is operating at. If you lie (that is, use some number for F_CPU that is not the actual frequency), delay will run shorter or longer than it should. F_CPU is also notably used to set the baud rate for the UART and can result in the serial data being sent (or received) at the wrong rate. Thank for this confirmation, as I suspected. I still am confused because in this short code, apart from the CLKPR code line, even if I change the F_CPU value from 1MHz to 8MHz the _delay_ms_(1000) is absolutely Not influenced, ei: the initial delay remain 6secON 6secOFF. How can we explain that? If F_CPU only influence the _delay_ms_ function why is there no change in delay ?. I really need to understand that behavior before going further. Thanks for your help. What you report is strange. You couldn't get any simpler than that ! the Arduino has set it to. I will not write "this is why I love assembly", because it will be a non-sense at this point. But, how is your AVR clock fuses setup? Most of the small AVRs comes with internal RC clock set to 8MHz with division by 8 active, so it runs on 1MHz. I don't know if your setup can reprogram the clock fuses, but start to think your setup is running on 1MHz frequency. You can change that, just need to find our how to change the AVR fuses on your software. 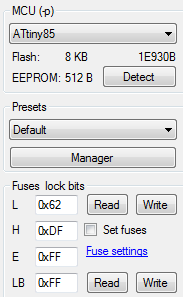 If you were using the USBASP (US$1.50) setup, the cheap USB programmer, I would recommend you to use AVRDUDESS or even Khazama software to read the fuses status. Thanks WagnerLip Not too sure, at this point, what fuses means but I did download , installed, WinAVR , AVRdude and AVRdudeSS following your suggestions. Might as well dive deep than contemplate . Here are my ATtiny85 Fuses setup. Not sure what they mean at this point. I will investigate further. Your input is very welcome. I'm still having this issue where F_CPU as absolutely no effect on my code timing. ?? 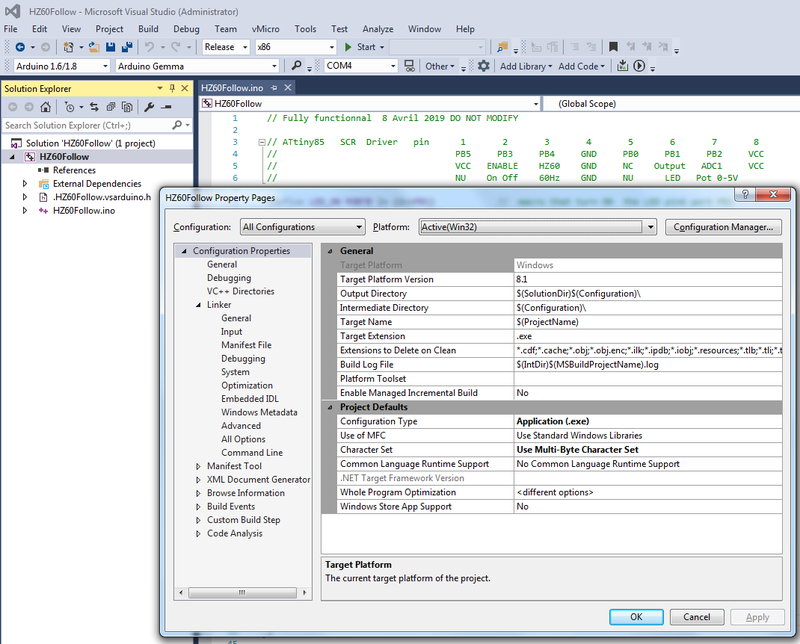 Visual Studio let you peek into the value. IDE show a default value of 8000000 . So now I know that the internal value utilized would be 8MHz. Still, 8MHz CPU frequency does not explain why my delay(500) turn out to be 4 seconds ? Because F_CPU is set to 8MHz but the chip is really running at 1MHz, eight times slower. When you use delay(500) it generates a loop of several million opcode to execute but it's the number to delay for 500 if the CPU were 8MHz but as it is 1MHz 500ms takes eight times longer, so 4000ms which is 4 seconds. it looks at your code. OP should be getting a warning about redefining F_CPU. Clawson, thank you for your input. I kind of suspected something like this after further reading. Still, how to explain the fact that if I change F_CPU, regardless of whether the real CPU clock is modified or not (which we know it is not) the delay function keep running with the same delay. I wish someone could come up with a real explanation to this behavior. You can always consult this online fuse calculator, where you can select AtTiny85. and see exactly the below information. Fuses on AVR are programmed reversed, if bit=1 it means it is UNPROGRAMMED. For the FUSE to be in effect, it must be zero. CKSEL3210 = 0010 and SUT1:SUT0 = 10 means "factory default value", Internal RC 8MHz, start up time = 14 clock cycles + 64ms. If you click the down arrow at the extreme right of the first pull down menu on "Features" of the above online fuse calculator, you will see all possible selections for CKSEL and SUT. If you will feel courageous enough one day to change clock settings, and plan to use external CRYSTAL, select any of the bottom half of the pull down menu, if by mistake you select "EXT CLOCK" and you have no external clock it will "brick the chip", it will not oscillate with a crystal, it will expect a pulsed line coming from a complete external oscillator. Most newbies end bricking the chip by misunderstanding the EXT CLOCK with EXTERNAL CRYSTAL. Again, "Crystal" is part of the internal oscillator of the AVR, the chip will drive and feedback from the crystal. If set to EXTERNAL CLOCK and you connect a crystal, it WILL NOT oscillate, chip dead, until you connect an external pulsed clock. 1 : RSTDISBL - UNPROGRAMMED. If this bit is 0 (programmed) it means the reset function on the pin is not resetting the chip anymore, and you will not be able to further program it via ISP, like USBASP. Some people need an extra I/O port pin on the chip, so disabling reset you gain PB5 as I/O pin... in some final product it could be neat, but no more programming on it, except if you use some bootloader and program the chip via serial RX/TX pins. 1: DWEN - Debug wire UNPROGRAMMED... Good, leave like that. 0: SPIEN - Enable Serial Program and Data Downloading, PROGRAMMED - Good, this is what allows you to use the ISP pins to program and read the chip, pins SCK, MISO, MOSI. If this pin is "1", you lost forever the ability to talk to the chip via ISP. The only way to reset the fuses to factory default is via "parallel 12V programming", you don't want to go there. 1: WDTON = Watchdog Timer UNPROGRAMMED. If you program this guy, "0", the WDT will reset the chip automaticaly after a certain number of clock cycles. This is used when you don't want the chip to lock or loop in certain routines or waiting some I/O that never happens. Your software MUST be reseting the WDT before it resets the whole chip, in order to keep the software running okay. Example, suppose you expect the user to press a key without 8 seconds, else the chip resets. You don't need to write a special routine for that, just program WDT for 8 seconds, and reset WDT once user presses the key. Around page 45 of the AtTiny85 datasheet you can find all the WDT configurations, 8s is the maximum, 16ms is the minimum. 1: EESAVE = Eeprom memory is preserved through the Chip Erase = UNPROGRAMMED. 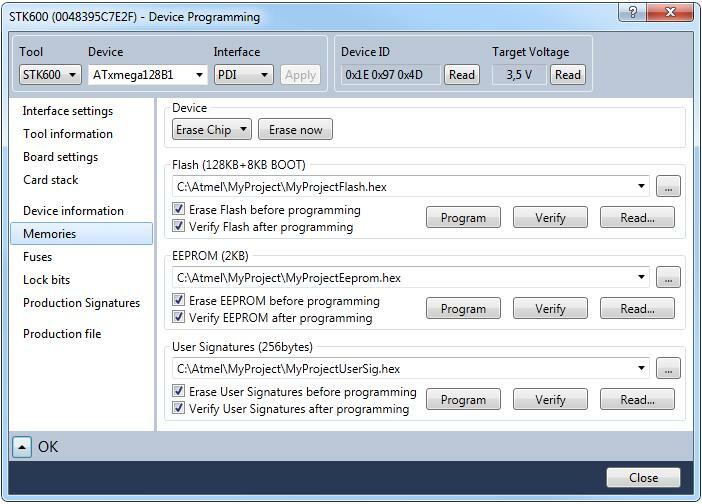 It means that when you reprogram the chip, it will do a chip erase, and the eeprom data will also be erased. Sometimes you don't want to lose the eeprom data when reprogramming, so to have that, just put "0" on this bit (PROGRAM it). 1: BODLEVEL0 This 3 bits specity the Brown-Out Detector Trigger level, it means, if the chip power voltage drops below the specified level here, the chip will reset itself to avoid problems. As the 3 bits are "1", means UNPROGRAMMED, so it will never reset by voltage drop. The EXTENDED Byte leave 0xFF, it has to be with Self-Programming. One day you need to mess with Fuses bits, just for learning and to feel more confident touching the guts of the beast, but always leave RSTDSBL=1, SPIEN=0 and never select External Clock, otherwise you may have problems and lose the chip. So, for you to change the chip to run on 8MHz, just change this bit 7 of low byte and that's it. You can use any ISP tool to change the fuses, even the one you used to read them. Then I got a headache. Still , none of the content so far have suggested any explanation to the core question: Why is #define F_CPU as absolutely no effect on my code timing. ?? Some suggested that it may have something to do with the compiler not taking into consideration the #define F_CPU line. Why ? and How to correct it ? Still , none of the content so far have suggested any explanation to the core question: Why is #define F_CPU as absolutely no effect on my code timing. ?? Perhaps re-phrase the situation NOW. What simple test program are you NOW using? What speed is your AVR running at NOW? With that current program, what results are you getting? What results do you expect? How are you testing? Normal stuff like toolchain and version and schematic and clock source and similar. But, in particular, what optimization level are you building with? It was mentioned earlier the F_CPU has no effect on the speed your AVR is running at. So yes, you need to re-phrase. Yes, if you lie to the compiler with an F_CPU value that does not represent the actual speed of your AVR, then delay_ms(1000); will not give you one second. MCU= ATtiny85 / Setup: Visual Studio and Visual Micro with Sparkfun Tiny Programmer. The Question: Why is it that by changing the F_CPU from 8000000 to 1000000 or 8000000UL or 1000000UL it makes no difference in the LED flashing period? Can you build the code both for 100000UL and 8000000UL then post the lss file from each here? It seems that io.h only checks the chip being used and include the apropriated file. Opening this file (all over the net) there is no reference to F_CPU whatsoever, even on this http://think.ow2.org/kortexdoc/arch/avr/avr.libc.include.avr.iotnx5-h.html it not states F_CPU. I know it must be somewhere, because if the user forget to include it, some standard default should take over. So, just for sake of that, I would move the line "#define F_CPU 8000000UL" to the end of the define lines, right before the "int main(void)", if some strange frequency is defined in obscure previous includes, this will override it. I guess. Given 16-bit ints 8000000 will be signed long. I think this is just a confirmation of my strong dislike of "arduino". In an attempt to make C++ simpler than possible it makes you blindly chase rabbits. Why is there no error message for redefining F_CPU? The Arduino market intention was not for the semi-pro or even an enthusiast of uC programming. It was intended for artists and low end blinking led application in general. For those, if the LEDs were blinking slower than expected, the user just reduce the value in the delay until they were satisfied. Those people really don't care what is the reason for that. blame should go to the Wiring library? ...but OP isn't running an Arduino sketch, is he? No loop() etc. post the lss file from each here? I'm not sure what is meant by "optimization level". ...but that isn't your "only question". At -O0 the GCC delay functions won't work right. From the LSS files we can see what is happening with the test program. Perhaps OP can also post the full build log. Why should there be? If I #define X as something, and redefine it later, is that an error in C? A lively conversation starter, but what does the merits of C++ and Arduino have to do with OP's test C program? Given the source shown, where is any "rogue" redefinition of F_CPU? The Arduino stuff is in post #5.
made a small test program and tried 1MHz and 8mHz F-CPU value. I have renamed the lss files so you can identify them. Note I took AS7.0.1931 started a brand new executable project and copied the C program from a comment here. added a // as to avoid an error on the F-CPU define and just hit " Build"
I unfortunately do not have a Tiny85 at hand to actually try the program and see that it indeed does what is expected, but the code suggests there will be a difference. So those two codes have radically different delays and will take a different time to flash when programmed into the hardware. If you are really saying that no matter which one you use the observed flashing is always the same then you are not programming those files into the hardware. There is a "gotcha" in Studio that catches a lot of people - the .hex name in the programming dialog is "sticky" so I rather suspect you once built some variant of code, programmed that, then did something to cause a different .hex to be built (maybe switching between "Debug" and "Release" perhaps?) and now you are building something different to that which you are programming into the AVR. On your machine make sure that the .hex file listed in "Output Files" is the same file as shown in the programming dialog. BTW if you use some other means to program the code to the AVR (such as avrdude perhaps) then equally check that in the command that invokes it the right pathname is being given for the file that is being built. I posted the code difference as guidance for the OP to clarify were he has to look and spot differences. At the OP: have a look at my example and check that your code does a similar thing. technically there should be no difference if you use Arduino or just Studio projects. the amount of code will be the same, but the count down counters will have a different value. Towards the end of this discussion there appear to be an explanation and some suggestions on how to change F_CPU. Arduino was a market phenomenon like several others. Something that appeared in the market at the right time, with right approach, and mostly, by the right price. It isn't because it was super-dee-duper-good, lack of competition with the same intentions was mostly the rocket that raised it into orbit. I remembered several other "testing" and "learning" boards in the market, most of them dedicated for the persons that wanted to learn about microcontrollers and programming, but none specifically dedicated for the ones "not wanting" to learn it all, just use. In some relative way, humans doesn't want to lose time learning about how a plier is made, forge metals, and how to assemble it, they just want a tool that they can use and to be very simple to deal with. Tools help us to reach a goal, complete an objective, finish a task. Right along Arduino and a little bit after that, hundreds of other "competitors" were launched, prices not so bad, RASPI was one of those, it sells pretty good, but obviously it requires "some" expertise to use it, install software. As far as I can see, RASPI greatest use is for multi-media player, it has all the chipset and connectors for it, without the HDMI port it would be almost useless. Like it or not, Arduino became a greatest hit, its price pushes people that has no electronics or programming knowledge whatsoever to buy (even in kit with several components and adapters), and lots of them just let it collect dust, but some people goes happy because they were able to build a "Love-O-Meter", or "Mood Cue", so you see, is not the Arduino that sells, the italians created "happiness in a box", other than "pizza". There are some strong study material opportunity about marketing in the Arduino, some competitors just never understood it. but they will give you something. #undef exists to allow deliberate redefinition. For clawson and all others involved in this investigation work, thanks a lot guys. Here is a test I did involving compilation of exactly the same code except for the #define line 8000000 and 1000000. This table show 9 files from the 8MHz version of the simple code. An identical folder is also created from the 1MHz version. In both folders we find the exact same file names except from the 8MHz to 1MHz. Not all files are content identical. Only the *.hex files are content identical from folder A to folder B. If this up-loader sends an HEX file identical whether 8 or 1 MHz this would explain the idiosyncrasy. Now the question is slowly shifting. QUESTION: Why would Visual Studio not build a difference compile file between two #define lines ? Where should I look to correct this problem ? It's the .Lss files that would be of use. There is a tick box in AS7 project settings to ensure they are created. clawson, I cant find any tick box within Visual Studio related to *.Lss files. Would there be a descriptive name perhaps ? I didn't say anything about a warning, whatever level. I was responding to the harrumph about no >>error<<. Aren't all errors during the syntax passes of the compiler against the rules of C? Maybe not; never really studied it. Only the *.hex files are content identical from folder A to folder B. Which makes a guess that the .HEX file isn't what you think it is. You showed a screen shot of your project -- yet haven't dug out the optimization level? definition and the two replacement lists are identical." OK MattRW - If I understand correctly : #define F_CPU 8000000 is useless since F_CPU is already defined in an #include file such as io.h or delay.h ? If I use #if defined F_CPU #undef F_CPU #endif and then I redefine F_CPU should the new F_CPU be taken into consideration correctly ? I tried it and still makes no difference. Whether I put in 8000000 or 1000000 it doesn't make any difference, even worst, it doesn't give the proper timing period. _delay_ms(1000) gives 8 seconds delay, _delay_us(500) gives 4mSec, _delay_loop_1(500) gives 750uSec, _delay_loop_2(500) gives 1.9mSec, with either 1MHz or 8MHz F_CPU, even after #undef. Normally F_CPU is not defined in either io.h or delay.h. having said that..... in delay.h there is a 'Safety define' for F_CPU. If you have not defined F_CPU in your program the delay will give a warning ( F_CPU not defined) and will define it as 1MHz. Same goes for the _delay_us(500) going to 4ms, that also is a factor 8. The other 2 I do not know what they actually do as they do not seem to have a time reference in the name and thus might well be just burning cycles uncalculated. Perhaps post the INO project such that others can have a look. I would have expected david prentece to be onboard by now, but as this is placed in the general mega/tiny forum it might be that he does not bother to look. How on earth do you use visual studio to invoke avr-gcc? The dialog you show talks about "win32", "Mfc" and creating .exe ?? Anyway, assuming that in the guts somewhere it is invoking avr-gcc tools then add a post build step that does an "avr-objdump -S output_file.elf > ouptut_file.lss" (replacing "output_file" with the real ELF name) and this will perform the step that would usually create an LSS. 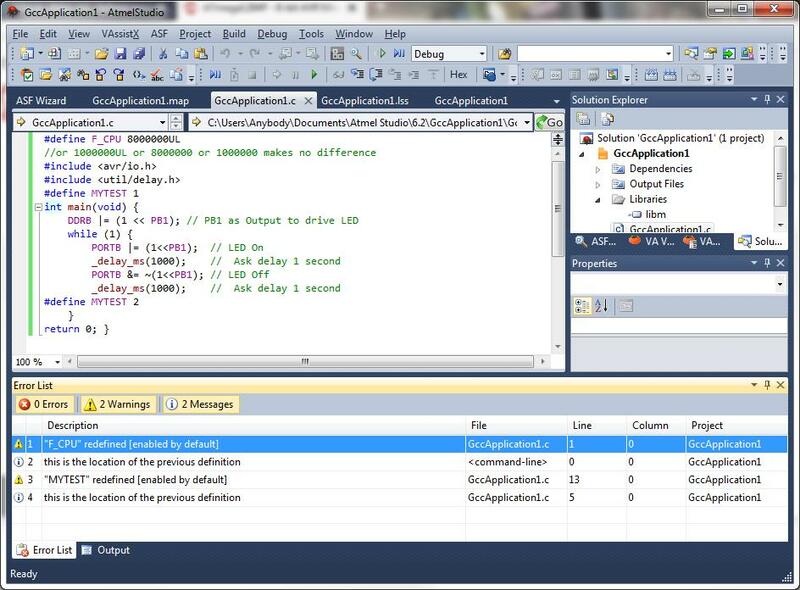 BTW I do wonder thought what possible merit there is in trying to persuade Visual Studio to build AVR code when Atmel Studio 7 *is* Visual Studio 2015 but completely re-engineered to do the best job possible of building avr-gcc code. OP keeps referring to VS/VM and it looks like you all are assuming he/she means AS7! Perhaps a clarification of what the OP is actually using and on what platform OS would be helpful? so he is using visual studio and the Arduino compiler. As I demonstrated with my tiny program there is a clear and distinct difference between 1MHz and 8mHz compile when using GCC. As already said the OP best make a INO ( arduino project file) that has this problem with him and post it here. There are a number of freaks here that do also have arduino installed so they should be quickly able to see what is wrong ( OP also states to be a newbie). re the standard: Now I have to dig into the standardese to see what an "identifier" means in this pre-processor context, as well as what an "object-like" macro is. If OP would post the build log for the test program, and the LSS output, then we don't have to debate how many angels are dancing on the head of this pin. It is a simple C [still not clarified] test program. The entire source and build results can easily be examined -- if revealed to us. Is F_CPU value passed to the build? Does an app get a warning if overridden in the source? An object-like macro is one without a parameter list. A function-like macro is one with a (possibly empty) parameter list. valid, but dubious code, e.g. "if(x=1) ..."
and invalid code (errors) that it will let you live with, e.g. redefining a macro name. compiler-testers over the meaning of "diagnostic message". The GNU guys think warnings count. Thanks. Still, I need to find carefully where a redefinition occurred in the posted dozen-line program. I'm still unclear about that Visual Studio versus Atmel Studio thing. So much could be resolved with a few chosen answers/posts. One of my early thoughts was "Symbols" in project properties making a -DF_CPU=nnnnUL that would over-ride any subsequent #define in .h/.c files. But if that were occurring then as Lee showed there would have been warnings about redefinition. Is there a way to show the command to avr-gcc? I usually include the argument "-DF_CPU=16000000" to avr-gcc and don't define it in any file. EDIT: Oh, it says defined on the command line.